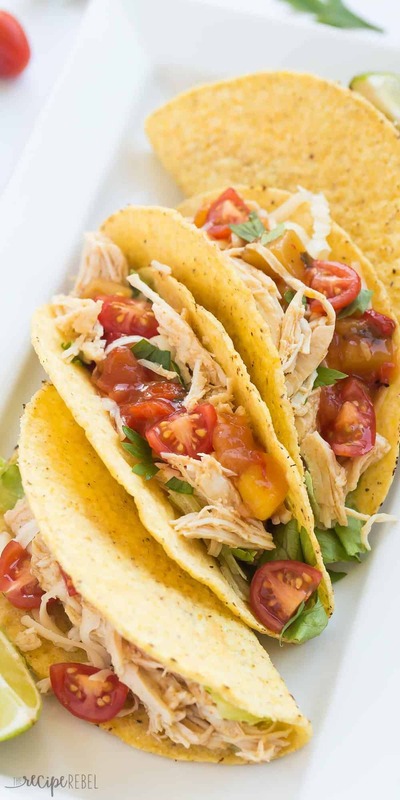 These Sweet & Spicy Slow Cooker Chicken Tacos are an easy, healthy, weeknight dinner! Just dump everything in the crockpot and forget about it. Step by step recipe video. So a couple years ago, we threw a taco party for our oldest daughter’s fourth birthday. When I was cruising the aisles of the grocery store, I saw some mango salsa and had to grab it. It was the most amazing thing on chicken tacos! 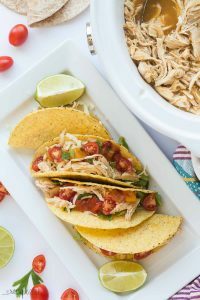 These slow cooker chicken tacos are so easy and also pretty healthy (depending on what you top them with! ), making them the perfect crock pot dump meal for a busy weeknight. 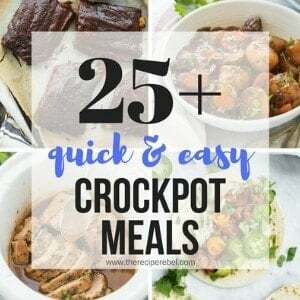 Dump ‘n’ Go slow cooker recipes (<– find 20 more of my favorites!) are about the most that we can handle here most days, with school and the 2 year old and the baby, and all the chaos that comes with the 3 of them. We love serving this chicken in hard taco shells, tortillas, or even over rice or as a taco salad (<– a great way to lighten them up even more!). You can definitely adjust the seasonings to suit your family’s tastes. I like to keep things relatively mild to start, because it’s a lot easier to add spice than it is to take it away. If you don’t have mango or pineapple juice, try orange, or feel free to substitute chicken broth (though you’ll miss out on that extra sweet, fruitiness!). Chicken breasts don’t need all day to cook in the slow cooker. I know this can make things a little more difficult if you work from home 8 or 9 hours a day. 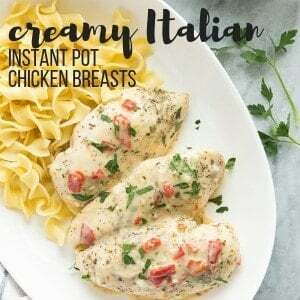 To slow down the cooking process so you can let them go all day and not come home to overcooked chicken, place frozen chicken breasts in the slow cooker in the morning, along with the other ingredients. I always start with my tacos fairly mild and then people who like extra heat can add jalapenos, a spicy salsa, or some sriracha sauce. Feel free to add some cayenne pepper or red chili flakes to the slow cooker as it cooks to take things up a notch! 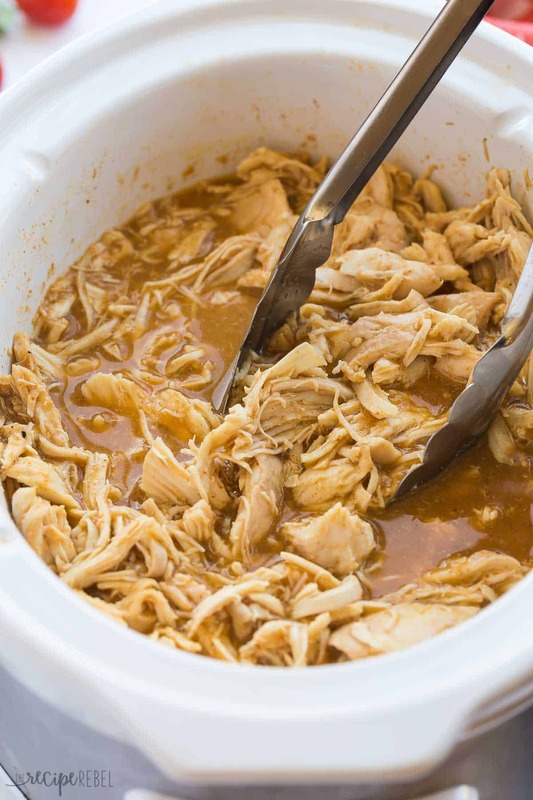 Place chicken in a 2.5-4 quart slow cooker. In a medium bowl or large measuring cup, whisk together juice, garlic powder, chili powder, cumin, salt, onion powder, paprika, and pepper. Pour over chicken in slow cooker. Cover and cook on low for 5-6 hours or high for 2-3 hours. Shred with two forks in the juices. Serve in taco shells or small tortillas with diced tomatoes, shredded cheese, lettuce, salsa (I love using mango salsa! ), lime wedges or avocado slices as desired. HOw long would you cook this in an instapot? I love dump and go recipes. They are just so easy, and it’s awesome to come home from work and have your food be (mostly) ready. 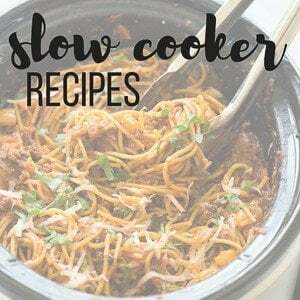 I have a slow cooker with a timer, so I just set it for a certain amount of time (usually less than the recipe calls for due to continued cooking after it shuts off) and not worry too much about over cooking. 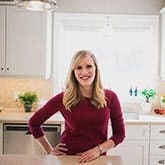 Love this recipe for healthy weeknight dinners! Oh that sounds amazing! I need to get me one of those! I see a taco night in our near future! These look amazing!